Since upgrading to the new PlayBook OS 2.0, one of my new favorite features has to be Print To Go. 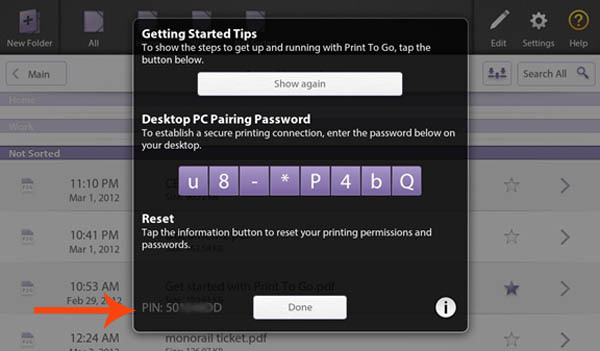 Previously previewed at CES 2012, Print To Go is a new feature in OS 2.0 that allows you to print your documents to your PlayBook instead of a traditional printer. This convenient utility app converts your files into an encrypted PDF and wirelessly delivers them to your tablet via a secure wireless connection. With all the boarding passes, receipts, train tickets, and other paper I accumulate this is a great way to organize of my files without killing trees in the process. Click on the jump to learn more. First, you'll need to download and install the desktop driver on your computer. Essentially, you're turning your PlayBook into another printer option on your PC. This means that when you click Print or Ctrl-P within any program (i.e. Microsoft Office, Internet Explorer, Google Chrome, Photo Shop, etc.) you'll be selecting Print to Go as the printer. Unfortunately, it's only compatible with Windows XP or higher (sorry MAC users) and is available for download at this link. There's just one thing you need to know first before you proceed. In order for Print to Go to work on both your computer and PlayBook they must be connected to the same wireless network. 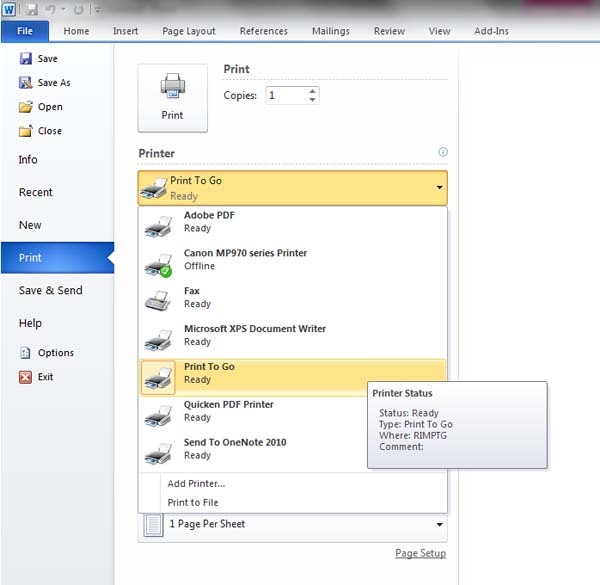 As mentioned earlier, printing your files is as simple as clicking print from within any application. Pictures, websites, documents and even Photo Shop files are all compatible and easily converted and delivered to the PlayBook. 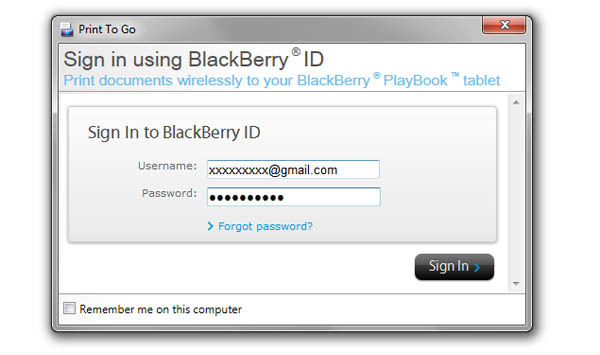 A popup box will appear prompting you to sign in using your BlackBerry ID. If you'd like to ignore this box in the future just check off the Remember me box. Now, here's the difficult part. 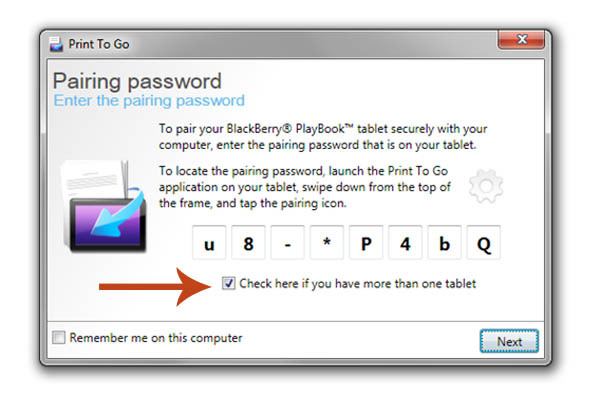 You'll need to pair your PlayBook with your computer using a secure pairing password only accessible from the PlayBook application. Simply swipe down from the top bezel and click on Settings. 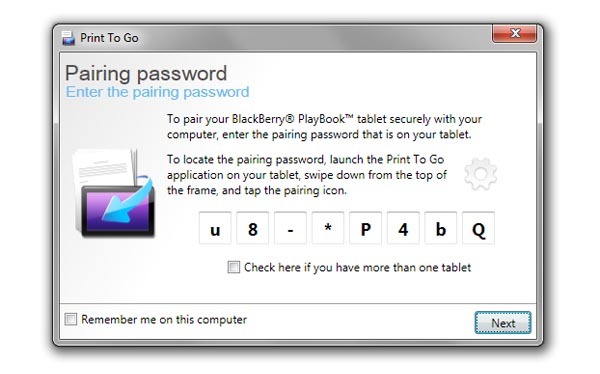 Under the Desktop PC Pairing Password will be the eight digit code to enter on your PC. This offers a quick and secure way for your computer to locate your tablet and send the file. Note: If you own more than one PlayBook and they are linked to the same BBID, please skip to the next section. Otherwise, proceed to the next step. Finally, type in a name for your document, or keep the original and click on Print to send. Once the operation completes, a notification appears within the application on your PlayBook that the file has been received. From here you can move, classify, search for and organize all of your printed files directly from within the app. Your files are also accessible using the File Manager browser introduced in OS 2.0. For those of you that own more than one PlayBook in your household (and who wouldn't) and they are associated with the same BBID, don't panic. It may add an extra step or two, but you'll be on your way to printing on whichever tablet you own by following these extra steps. Print To Go distinguishes between the two tablets using a unique identifier which just happens to be the BlackBerry PlayBook PIN #. Do not, and I repeat, do not confuse your PIN # with your pairing code or vice versa. Thanks goes out to forums member peter9477 for this tip. 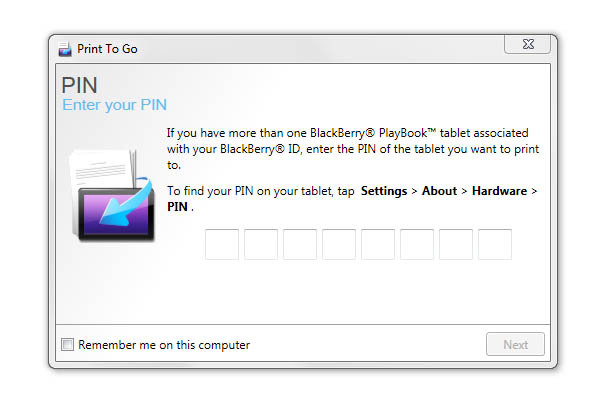 Quick Tip: With Print To Go you don't need to go into settings or connect your PlayBook to Desktop Manager to locate your PIN. As a matter of fact you don't even have to exit out of the application. You may not have noticed but it displays your tablet's PIN right in the bottom left hand corner of the box that shows your Desktop Pairing Password. 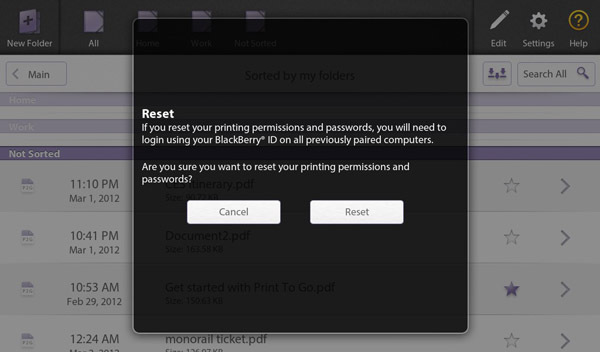 Print To Go includes the option of resetting your printing permissions and changing the pairing password. Considering I just posted mine for all to see, its something I needed to learn quick! 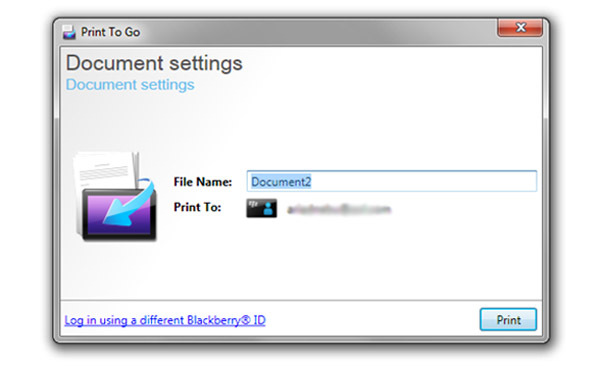 Print To Go does away with all the messy paperwork and manila folders and lets you organize your data files (i.e. websites, presentations, documents, pictures, boarding passes, itineraries, etc.) without the nasty paper cuts. You can filter your results, search for a particular file, delete files or folders, or group documents together in their own folder. Using Print To Go is quick and easy and, because its wireless, eliminates the need to mess around with wires whether you're in the office or on the go. Be sure to hit up our BlackBerry Help page or check out the BlackBerry PlayBook forums for more help with your OS 2.0 questions.